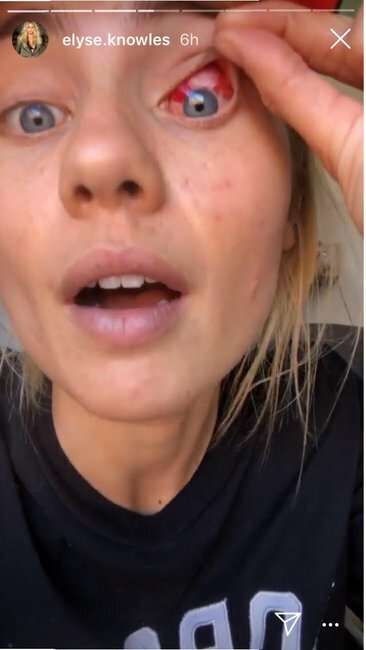 Elyse Knowles shares after-surgery photos of her eyeball on Instagram. Elyse Knowles just shared photos of her "freaky" eyeball post-surgery and um, OUCH. Warning: “Freaky” (and very sore-looking) eyeball ahead. 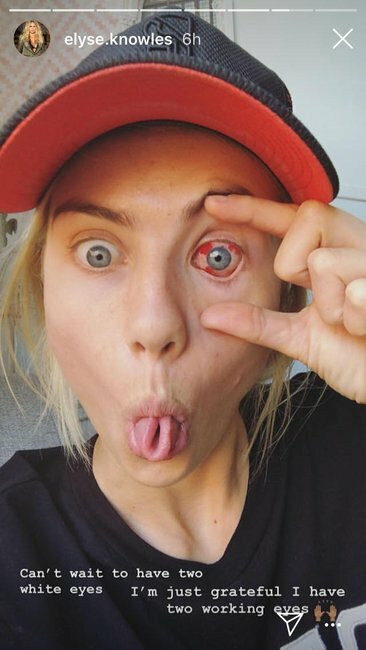 Model and TV star Elyse Knowles has taken to Instagram to share post-surgery photos of her eyeball, and it looks very red and bloody. The former The Block winner and face of Myer underwent surgery on Monday to remove a growth on her left eye. And, well, you can have a look for yourself below. 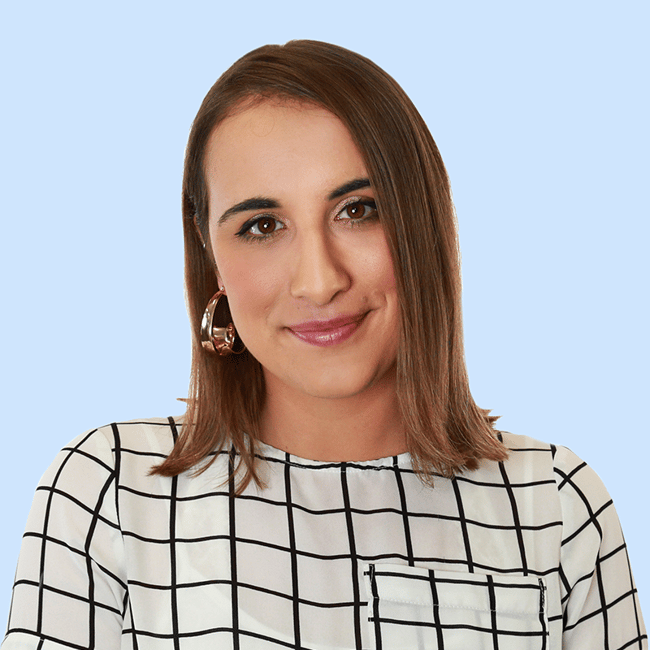 Psst, Elyse recently joined us for “In Her Bag” on our You Beauty podcast. Check it out (with your ears) here. A growth she "swears she got from modelling" and constantly having reflectors in her face. The 26-year-old reality TV star shared up-close videos of her bloody eyeball, pointing out where her stitches were and describing the surgery. "I&apos;ve always had red eyes," she began. "I always look stoned, or like I&apos;m half-asleep at work," she joked. "So I decided to get (the growth) off as it was always getting irritated by makeup." 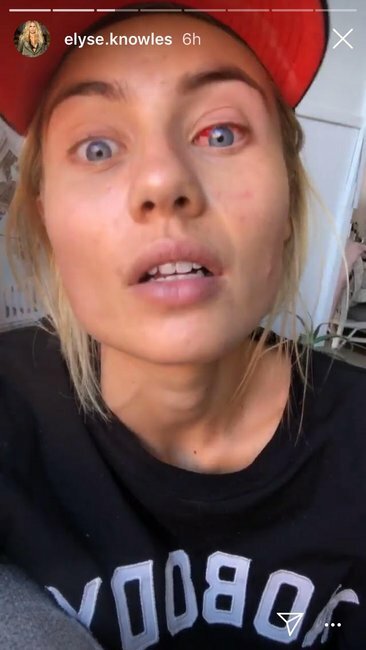 Describing her red eye as "freaky", she went on to explain what the surgery entailed, while lifting up her eyelid so we could cop the full image. "Got stitches in my eyeballs. They took some white from my eye up here and put it here," she said, pointing to two separate parts of her sclera (the white part of an eye). Despite her injury, Elyse seemed to be in good spirits as she described her theory on how her eye growth came about. "I forgot to tell you how I got that growth! I swear it&apos;s from modelling. Always having reflectors in my face and people telling me to look into the sun and smile, &apos;look like you&apos;re enjoying the sun&apos; all while going blind at the same time... yeah thanks," she joked. She added that the procedure had gone well, and that her vision has not been affected. ...But it still looks extremely painful. We wish her a full and speedy recovery!